It is very important before logging in you ensure to select the correct server. 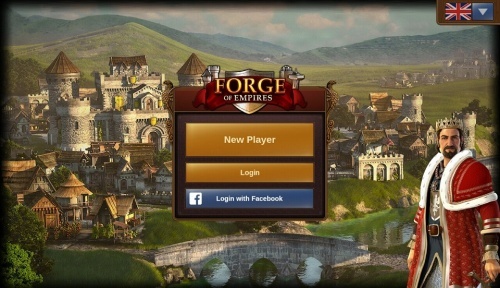 In the top right hand corner you need to tap the small flag, this will open the below page listing all Forge of Empires servers, here you will need to select the server you want. If you are a new player you can choose to play the game without registering an account. This option will automatically generate a guest account for you. In order to save the progress of your game however, you will still have to register your account at a later point in time. This will be triggered as a special part of the tutorial. The corresponding quest will ask you to choose a name and a portrait and register your account. The Forge of Empires App provides a convenient way of playing Forge of Empires on your mobile device and grants access to the game features needed to maintain your game account. This wiki page will aid you in using the app by defining the apps user interface and also displaying the little differences in usability between app and browser version. Note that the app is now available on iOS and Android devices. all Kindle Fire devices except the first generation Kindle Fire (2011) are supported, including Fire Phone. If you have played the browser version before, you can use the login to access the game with your existing account or with your facebook account. But you can also register a new account using the registration screen of the app. Please remember that you can only have one active player account per world. Once you logged in, you need to select the world on which to play. To the top left of the screen you have small square boxes containing your quests - follow these as they will guide you through the game, some are optional and can be skipped. Global Ranking - Currently you can see what number you are ranked among the players of is world. When you tap the ranking though this wont open as yet until the full global ranking is released. When available, you will be able to view all players on the same world. Population - this number tells you how many free population you have. If you tap here, it will open a small window telling you what total population is, and how much free population you have a able to use. Next along is the smiley face - you want to keep this gold all the time, as this means your townspeople are enthusiastic which gives you a 120% boost your productivity. All coin and supplies buildings will produce more, and when you fight you will receive more points also. Again, tap the face for more detailed information. In the top middle, is your forge point bar. You accrue 1 forge point per hour to a total of 10. You can buy more forge points by tapping the small plus sign on the bar. Forge points are used to open all your technologies, donating to great buildings, and paying for trades. Then on the top right you can see your diamonds coin, supplies and medal balances that you have, You do win diamonds from some quests but these are rare. You can also purchase diamonds by pressing the small plus side beside.). Tapping on the arrow will allow you to see the whole menu. This is the build menu. In here you will find all items currently available for you to build. You can see there are numerous options along here - houses, supplies, decorations, military buildings and even your expansions to make the city bigger; these are all in here. If you look at the image, you can also see that when the build menu is open, at the far top middle are two small icons MOVE and SELL. Next to expansions is roads, all trails, and roads unlocked are in here. To build your roads, click on the type you would like build, then on your city place this first segment where you would like the road to begin, and press the green tick. Then you can see small arrows beside this piece of road, swipe along the screen where you wish to build the road, when done press the green tick once more, this will then place the road for you. If you wish to move a building, you need to tap the MOVE icon so it is highlighted, then click the building you wish to move. Once in the spot you are happy with, click the green tick, as shown on the image below. Selling items works in the same way. First, open the build menu, then tap the SELL icon so it is highlighted and press the building you wish to sell. You will then get a small window asking you to confirm the action. It will open the tech tree. By swiping the screen you can scroll along to see future eras. You must unlock certain technologies before you can open those further along. By tapping on each tech you can see the cost to unlock it. When you meet these costs that tech will open and then display a green tick as you see in the image above. Whatever building or item it is you opened, will now be available in your build menu to place in your new city. Map - this is where you will discover new lands by fighting and negotiating. You will also be able to unlock PvP Towers and good deposits which you will need to produce goods. I will add a screen shot here of the first map you will start a new game on, you can see on this image that the province is in red - this means the province is not yet owned. Within each province are smaller sectors, each sector you will need to either negotiate, which is to pay goods instead of fighting, or fight a battle to win the sector. Fighting will also gain you battle points towards your PvP tournament, and add points to your personal player score. Here is another image; within this province there are 3 sectors. One is green to show owned, and two still need to be conquered and are still red. Once you have fought/negotiated all sectors you win that province on the map. You will now see new options to scout new lands, though you can only perform one scout at a time, and while the scout is scouting, you won't be able to see any other scouting options until complete. Here I have added two images, one showing before the scout, and one showing the scout in action. Just like the tech tree has ages you move through, the continent map works the same way. You will start in Bronze age, and as you open more lands you will move into new ages on the map. Later you will use ships and planes to discover new lands! Each province holds a different reward; some will give you goods boosts, some will reward you coins and supplies, expansions to place in your city, and also the PvP towers are unlocked on the continent map. Any barracks you build in your city can be used to train units, when trained these units will appear within your army management, as well as any other unattached units you might win along the way. The layout is quite simple; along the bottom is your unit pool where all your units will be, whether they are attached to a barracks or unattached. Up above is the currently selected army; when you want to fight, either a neighbour or on the continent map, you will select 8 units from the unit pool, by tapping them and then press the orange swords. They will then move up into your selected army, these are the units you will fight with. You cannot use more than 8, although you can use less, so be careful not to enter battle without selecting a full army first! Next you will want to set a defence for your city, otherwise when your neighbours attack you might get plundered! To do this, tap the unit from the pool below, and then click the blue helmet icon. this will then surround that unit with a blue border, this is now set as your defence. Again, you can set 8 units this way. These are the units that your neighbours will face should they decide to attack you. Finally, as you advance through the game you will gather a large army from all the different ages. When you have many units it can be time consuming finding the ones you want, so there is a small drop down to the right hand side that you can tap; this will filter units from a specific era. Below you can see in the image, the army management layout, this has now been updated as was slightly different to this. By tapping a unit you then have the option, to add to selected army, to heal the unit with diamonds, to set as defence, and also the red x is to delete that unit. This is your market where you can trade goods. As mentioned earlier you will win goods boosts on your continent map. There are 5 goods every era that you can construct buildings to produce. But you will only get 2 goods boosts each era. Ideally you want to produce the goods you have a boost for. With no boost a goods building will make you 1 good per 4 hours. With a boost your goods building will make 5 goods per 4 hours. So you see producing with no boost is not ideal. You can use trade, to trade for other goods you need. You can see all trades which have been posted by players who are in your neighbourhood, guild, and friends list. To take a trade from a guild member is free, but to trade with friends or neighbours will cost 1 forge point per trade; the player taking the trade pays the forge point. The second tab is create offer, here you can place trades from your goods stocks for others you need. You will select the good to trade, and the good you need, enter the amounts, then post your trade. When you open your inventory you can view your goods stocks. This will show you all of your current goods stocks as well as your medals balance. You can scroll down to see goods from the other ages. The middle tab titled 'Inventory' will show you all items you have stored, this might include buildings or decorations you have won, any forge point packages that you win will go in here also. You can place any items from your inventory into your city - provided you have space and the necessary resources of course! Tap on the arrow to display it. This shows you any recent activity related to your town; any one who has visited you and motivated or polished your buildings will be listed here. You can also see any attacks - and whether you won or lost these, and if you have been plundered. The second tab displays your message center, this where you can open your guild conversations and all messages you received and reply to them. Expeditions are a guild feature, so you need to be in a guild to be able to take part of it. You need to make your way in the jungle by fighting or negotiating and you will earn not only personal rewards but also power for your guild. This allows you to open you guild window and to manage your guild. In the first tab you see your guild profile and members. Taping on the 3 bars on the top left will allow you to Administrate your guild or leave it. Taping on a guild member will open a menu to interact with him or change his guild member rigths and title. In the guild administration window you can change your guild flag (by taping on it), name and description, change the way players can join your guild and handle guild invitations/applications. You can dissolve your guild by taping on the top left 3 bars. The level tabs displays the level of your guild with it’s current power and bonuses. The treasury tab displays goods in your guild treasury and allow you to donate goods. here is where you can come and check which blueprints you have gathered so far. You can also click the great buildings tool tips (the blue question mark), which will then show you more information about that building. By tapping on the image of the great building, this will open a larger description for you, and show the goods needed to place that great building within your town. Tapping on the square with the 3 buddies will open it. The first tab with 3 top arrows is the neighbourhood bad. By taping your portrait you will be able to change it. If you tap on another player portrait you can interact with him. If you visit another player city you will be able to polish, motivate or plunder (if you fight against him and won) any of his building. If you tap on motivate, you can choose any bulding with a grey star on the top to motivate. The second tab with a shield displays your guild members. There you can also open your guild window. If you currently in no guild, guilds will be displayed there. The third tab with 2 buddies displays your friend list. There you can accept friend invitation or remove friends.